Hideo Nomo retired from baseball today. This Giants fan is giving him his props. This will be the only time I will ever post a photo of a Dodger. I couldn't bring myself to use a photo of him in the blue uniform, so I found this one instead - the classic torpedo wind-up. 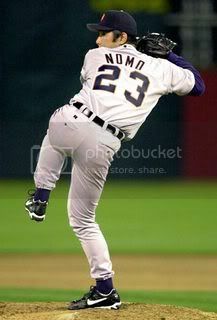 Nomo is the only Dodger I've ever liked. He was the pioneer. The first Japanese player of my generation to play in the Major Leagues. He pitched a no-hitter in both the NL and AL - Coors Field no less! He paved the way for Ichi, the Matsui's and the other Asian players playing today. Another Giant fan had this to say: "I respected him, admired him and loved the torpedo. I could never cheer for the Dodgers, but I cheered from him. (NOTE: this Giants fan is married to a Dodger fan). That Dodger fan had this to say, "This era is not the steroid era; its the era of the 'Gateway to the East.' If you'd like to still pick him up in your fantasy baseball leagues, he's available, except in mine, I still own him. And he'll be the next manager of the San Francisco Giants." Nomo-ichiban! Power To My People!